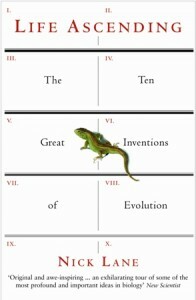 In Life Ascending, Nick Lane, Honorary Reader at University College London, talks us through what he believes to be the ten greatest inventions of evolution on Earth, and succeeds in making a very convincing case for each one. In deciding which of the multitude of biological innovations to include, Lane explains that he has primarily guided himself by the evolutionary inventions that have not only most revolutionised life on Earth, but also those inventions that have revolutionised the planet itself. The development of oxygenic photosynthesis by cyanobacteria, and the profound shifts in the biosphere and chemistry of our entire planet that this drove, is one obvious example of just such a ground-breaking innovation. So, chapter by chapter, Lane leads us on a tour through deep time, beginning with the very origins of life on Earth, and, fittingly, finishing with the subject of death: how programmed cell suicide is utterly crucial for the survival of multicellular life. Along the way, Life Ascending takes in DNA and molecular information storage, photosynthesis and the harvesting of sunlight, emergence of the complex eukaryotic cell, development of sexual reproduction, advances in cellular motility, evolution of eyes and animal sight, the development of warm-bloodedness, and the mysteries of consciousness. The earlier chapters are probably of most relevance to astrobiologists, but the entire book is written in such an engaging style that you’ll find yourself racing through the rest of the story. An early treat in the book is Lane’s review of the differences between black smoker vents and the cooler, alkaline serpentine vents, and a sterling argument as to why the later are by far the more likely location for the origins of life. Another highlight is Lane’s championing of the “fateful encounter” theory of the emergence of the complex eukaryotic cell; not by a host cell engulfing free-living bacteria (phagocytosis) that eventually became our mitochondria, but by the gradual symbiotic union of both bacterial and archael cells. As a prokaryotoic cell grows large enough to be able to engulf other cells it becomes steadily less capable of energy generation, and so Lane argues that the appearance of mitochondria in the eukaryotic cell must have preceded the development of phagocytosis. Lane has been extremely diligent in his research, and the book is bang up to date in the diverse research fields covered by his far-ranging chapters. In particular, Life Ascending provides a refreshingly original take on the debate surrounding the origins of the eye, and how not only is it true that 50% an eye is better than 49% (countering creationist’s claims that the eye is of ‘irreducible complexity’ and so could not have resulted from the stepwise evolution of intermediates), but in certain circumstances half an eye is actually superior to a whole eye! The example discussed in Life Ascending is of the shrimp species surrounding hydrothermal black smokers which have been found to reabsorb their larval eyes so that adults instead rely on lensless naked retinas on their backs: sacrificing surplus resolution for sensitivity. Lane is a biochemist, and this is clearly apparent in the strength of the early chapters of the book. I found the penultimate chapter, dealing with consciousness, to be relatively weak, but then the problem of consciousness, and how the mind and sense of self are generated by the physical organ of the brain, is undeniably one of the greatest unsolved mysteries of science and so perhaps any treatment of this thorny issue is likely to leave a reader feeling unsatisfied. Lane’s dismissal of different theories attempting to attribute consciousness to various quantum effects within the brain is characteristically level-headed and particularly illuminating. Life Ascending really is beautifully written, and Lane has a true flair for scientific story telling. Not only is the narrative utterly gripping, but the book is also careful to make clear the distinction between well-established facts and the more speculative arguments.